Medieval Castle Blog: When Were Medieval Castles Built? This is a good question and a common one for many people when they first become interested in medieval history. Medieval times spanned several centuries so you might have an early medieval castle or a late medieval castle, both of which belong to the same definitive period in history (ie. medieval) BUT both quite different in their castle archictecture and construction. A difference of 300 hundred years in when these castles were built, representing the passing of many generations of castle builders, architects, carpenters and stone masons. Dover Castle in England was built on the coast whilst Threave Castle in Scotland was built inland on the river Dee. 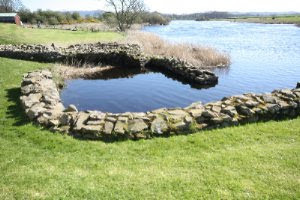 A notable point about Threave however is that it was built with its own little harbour on an island in the middle of the river - see photo which I took when visiting Threave Castle in 2009. For more details on when medieval castles were built read the Medieval Castles Timeline. What Are The Best Parts Of A Medieval Castle? Fancy Buying Your Own Castle? Weddings In Castles - How Romantic!